How do I connect Klipfolio and Twitter? You can set up a connection between Klipfolio and your Twitter data to display your social media metrics on a dashboard. What options do I have for visualizing my Twitter data? Twitter pre-built data sources: Data sources provide the foundation for Klip building, so we suggest you create a data source as a first step (before building Klips and adding them to your dashboard). Our pre-built data sources focus on the most sought-after Twitter data and are found on the Service Connectors page, available from this link or from your list of data sources. When you select a service connector from this page, the data source for that service is automatically added. Twitter pre-built Klips: Pre-built Klips enable you to quickly set up a dashboard using predefined visualizations that display common key metrics. Pre-built Klips are found in the Klip Gallery or, for White Label customers, in the Integration Gallery. Twitter pre-built dashboards: Pre-built dashboards provide an efficient and effective way to gather thematically-related Klips into a single, purposeful dashboard. Pre-built dashboards are found in the Dashboard Gallery. Custom data sources: When you create a custom data source, you can either use the pre-built data source as a starting point from which to write your own query or you can write your own queries from the ground up and build a data source from scratch. You create custom-built data sources from the Service Connectors page, available from this link or from your list of data sources. Regardless of whether you choose pre-built, custom-built, or a combination of both, before you start building Klips and dashboards you need to connect to Twitter data in Klipfolio. How do I connect to Twitter data in Klipfolio? When you connect your Twitter data to Klipfolio, you will be prompted to connect your Twitter account by entering your username and password. Doing so will create a token that enables Klipfolio to securely access your Twitter account. Your token looks like George@Twitter. You can use and reuse the same token every time you connect to Twitter. Note: You manage your connections (tokens) to Twitter in Klipfolio under Connected Accounts in the Account section. How do I add a Twitter pre-built data source? Navigate to the Service Connectors page in Klipfolio and choose Twitter from the list. Click Connect an Account. Enter your Twitter login credentials and click Next. If prompted, click Allow Access to enable Klipfolio to securely access your Twitter data. Click Next Step. On the Configure Data Source page, if prompted, enter your Twitter Handle or other requested information. How do I add Twitter pre-built Klips? In the Klip Gallery or, for White Label customers, in the Integration Gallery, you can browse individual Twitter pre-built Klips and add them to your dashboard. You replace the sample data that is included in pre-built Klips with your own Twitter data by clicking the menu in the Klip and selecting Connect your data. How do I add Twitter pre-built dashboards? In the Dashboard Gallery, you can browse and add pre-built Twitter dashboards. You replace the sample data that is included in pre-built dashboards with your own by clicking Connect Your Data at the top of the dashboard. Note that our pre-built dashboards, for example our Social Media Command Centre, include several social media related services and don't focus solely on Twitter data. How do I create a Twitter custom-built data source? If you choose to create a custom Twitter data source, you may need to enter your Twitter screen name into a specific spot in the query. 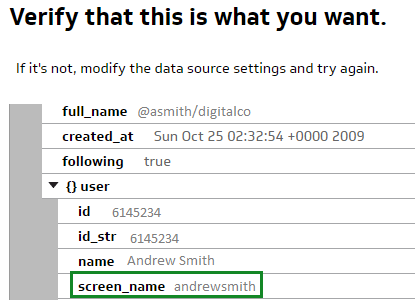 On the Pick a Data Request page, click Create a custom Twitter data source. On the Configure Data Source page, enter this query into the Query URL text box: https://api.twitter.com/1.1/lists/list.json. Find your screen_name under user. See the following example. For example, replace <screenName> with your own screenname. Edit the Query URL to return the data you need. Refer to the Twitter API documentation for details. How do I create a Twitter data source from scratch? Use the Twitter API Console to build and test your queries before you use them to bring data into Klipfolio. Refer to the Twitter API documentation to discover more data requests. When you are happy with your query, click Submit, and then save and name your new data source. You're now ready to use it to build a Twitter Klip. Note: This query uses %40 for the @ symbol. How do I create a Twitter custom Klip?